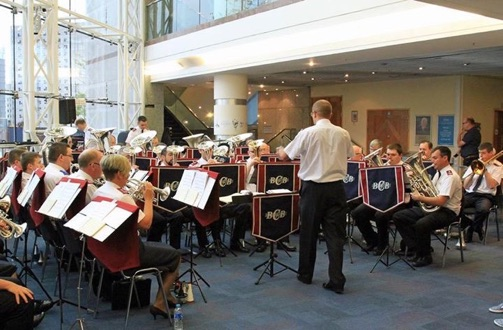 Birmingham Citadel Band (Bandmaster Gavin Lamplough) were once again pleased to perform in the foyer of Birmingham Symphony Hall before the commencement of the British Open brass band contest on 10 September 2016. As usual, it was an early start for the band, but with people starting to gather early, the band all arrived and set up, ready to provide pre-contest music for those in attendance. 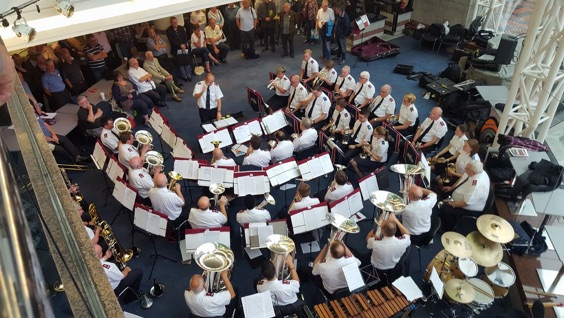 Birmingham Citadel Band (Bandmaster Gavin Lamplough) plays in the foyer of Birmingham Symphony Hall prior to the British Open 2016. Share my yoke and you will find that I am joined with you. The next item on the program was Jubilo, Jubilo (Martin Cordner). This item has proved to be very popular with audiences in previous performances (although less so with members of the band! ), showing a lighter side to the band. Another switch in mood followed, as principal horn Neil Blessett brought the solo A Time for Peace (Peter Graham). The melody of this solo was taken from Graham’s major work The Essence of Time, and Blessett once again showed his musicianship and beautiful tone while performing this lovely tune. Escape Velocity, another work by Martin Cordner, was the next item on the band’s program. This was a “first outing” of this piece for the band. Another solo item followed as principal euphonium David Taylor performed Troika? Tidy! (Karl Jenkins). This piece is a technical challenge for both soloist and accompanying band, and both rose to the challenge, with Taylor particularly impressing the listening audience with his technical prowess and ability. Once the buzz from Taylor’s solo settled down, the band went straight into Hold That Fort by Sam Creamer. Creamer is an Australian Salvationist who is quickly gaining a reputation for writing brass band music in styles that might not be the norm for a brass band. This piece is no exception and his “funk” interpretation of an old Army tune is an excellent example of his work. Times when I fear my faith may not last. Help me, support me, Lord, help me get through. Lead me through darkness till light shines anew. To all the peoples – peace! And make for life’s increase. An Army tradition is to finish a concert with a march, and the Birmingham Citadel Band did not disappoint as they gave a rendition of The Witness (William Himes), after which the members were able to meet with friends old and new before the start of the British Open. This event is an excellent ministry opportunity for the band, which is not taken lightly, and the band hopes that it was able to both bless and entertain those in attendance that morning in equal measure. This article was posted in News and tagged Birmingham Citadel Band, Birmingham Symphony Hall, British Open, concert, David Taylor, Gavin Lamplough, Neil Blessett, Nicola Redhead on 28 September 2016 .